In 1889, Paris unveiled the magnificent Eiffel Tower. It was a worldwide sensation. London, meanwhile, was green with envy. Not about to be outdone, city officials announced a competition for a grand monument of its own, and revealed 68 of the entries in a showcase catalog. 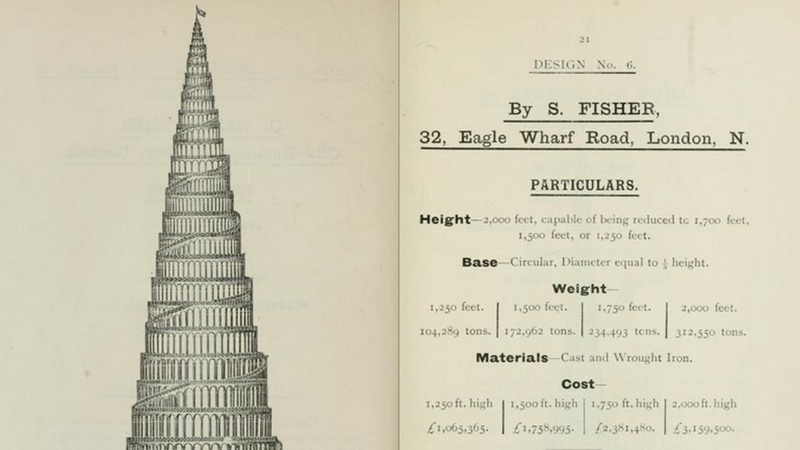 Most of these designs are pretty bonkers, and thanks to Public Domain Review, which has published the booklet in its entirety, we can now see every one of them. One calls for an aerial colony with hanging vegetable gardens and a one-twelfth scale replica of the Great Pyramind on the top. Another looks like the Roman Colosseum turned upside down. Most of them are nearly rip-offs of the Eiffel Tower, the very structure the competition was responding to. In the end, entry number 37 designed by Stewart, McLaren, and Dunn won the 500 guinea prize for their plan for a tower that, alas, still looked strikingly similar to its Paris counterpart. It called for a 1,200-foot oriental-style steel tower with panoramic views, and three different stages. The first stage was to be 20,000 square feet, including an octagonal central hall, and a 90-bedroom hotel. The second would have an additional 10,000 square-foot hall, and the third would have a restaurant and other vague amenities. Construction began in 1892 but stopped short at 154 feet, when the project ran out of money. And there the botched structured remained, known as the London Stump or Watkins Folly, until 1904 when it was demolished for safety reasons. In 1923, Wembly Stadium was built over the site.